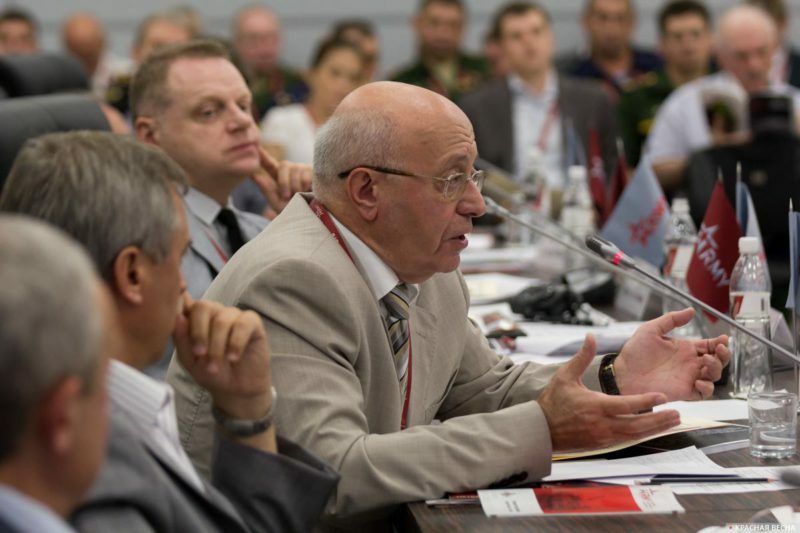 “What we are facing is not a hybrid war, but a para-war, a situation where everything has become war: economic war, political war, social war, cultural war etc.,” the leader of the Essence of Time movement, Sergey Kurginyan, said at the Pressing concerns of the defense management of the Russian Federation roundtable discussion held as part of the Army-2017 forum on August 23, Rossa Primavera Information Agency reports. According to Kurginyan, special attention must be paid to structures and tools for studying “para-war”; this may require new units fighting on this new battlefield to supplement classical army. “When talking about forecasting we mean two aspects: objective multi-dimensional processes, and actors with their motives. However, what actors do is not always rational. For example, from the rational point of view, Hitler should not have attacked the USSR,” the political analyst said. Sergey Kurginyan added that “very often, objective processes are believed to have the decisive role. However, this approach is misleading, because in everything related to war, we often go beyond the classical idea of the scientific approach, so if we rely solely on the classical scientific approach, we will never avoid errors”. The speaker stressed that conflicts lack the relationship between subject and object, as it mostly happens in science, but the relationships are between subject and subject, where the subject is aware that it is being studied and played against, and thus it can make unpredictable, irrational steps. “Also, Russia cannot win in the global game unless it regains its conceptual leadership that it abandoned 25 years ago. We must again have a policy based on our own principles, meanings, but not only criticize the Western ones. Creating structures for para-war and regaining conceptual leadership will give Russia a chance on the global stage,” Sergey Kurginyan said. In Western countries, non-classical types of warfare have been the object of study for a number of years by leading think tanks like Chatham House, Brookings, CSIS, and many more. On August 23, as part of the second day of the Army-2017 international military forum, a roundtable discussion was held, entitled Pressing concerns of the defense management of the Russian Federation, which was hosted by the Military Academy of the General Staff (MAGS) of the Armed Forces of the Russian Federation. The roundtable program includes talks by a number of leading experts: Director of MAGS of the Armed Forces of the Russian Federation, Lieutenant General S. V. Kuralenko; Deputy President of the State Duma of the Russian Federation, I. A. Yarovaya; political analyst, leader of the Essence of Time movement, Sergey Kurginyan, General Director of the Institute of Foreign Policy Research and Initiatives, V. Yu. Krasheninnikova, representatives from Moscow State University of Foreign Affairs, Lomonosov Moscow State University, Russian Presidential Academy of National Economy and Public Administration, People’s Friendship University, Financial University under the Government of the Russian Federation etc. This entry was posted in News from Russia and tagged Classical War, Russia, Sergey Kurginyan. Bookmark the permalink.